The year 1800, when Schiller (the German poet, playwright, and philosopher) published his play Mary Stuart, was one moment in a formidable transformation in European aesthetic understanding.The conception of history was turning away from the rational terms of Enlightenment philosophy whereby art strives to be a true representation of life, to an approach that conceived of art as the form that reveals what everyday reality distorts in nature and humans. But history is still the stuff of life, and for his play Schiller chose two historical characters as dramatic as they come: Mary Queen of Scots and Elizabeth I. The tumultuous stories of the two monarchs and the fierce conflict between them represent the complexity and artifice of Western political history, and perhaps even add an element of intricacy through the distinction of gender. In Peter Oswald’s luxurious English adaptation of the play, we get a glimpse of the convoluted – though inevitable – dynamics that Schiller saw as controlling our lives (as well as the lives of powerful people). If we are caught in the web of civilization, then it is art’s role to interpret the machination of history and unearth the dark drives that propel our passions to acts of destruction and even self-destruction. Under the direction of John Heimbuch, the company of Walking Shadow Theatre has delved with zeal into the roles of the historical characters and the actors enact with sweeping force the entanglements that hurl them around without the ability to fathom the consequences of their actions. Schiller’s queens epitomize the dichotomies manifested in human character. Mary, the exiled queen of Scotland, imprisoned in England for eighteen years, is portrayed as a young, passionate, sensuous, and courageously contrite woman. She is also an avid Catholic, the religion of exuberance and sensuousness. Elizabeth is older, cold and arrogant, dismissing Mary’s pleas for justice with bitter cynicism. She is the Protestant queen, practicing the more stark and personalized religion. Jennifer Maren is a fiery Mary Stuart, a woman proud of her eminent standing but willing to admit the mistakes she had committed in the past in order to retain her dignity in the present. Indicted as traitor to the British throne, Mary claims that she doesn’t “reject the law, only the judges” who rely on false evidence. 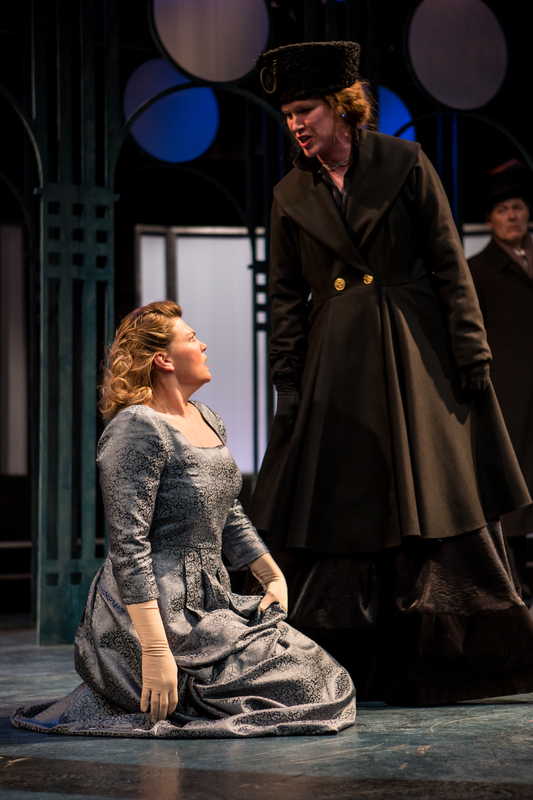 As Elizabeth, Sherry Jo Ward commands the attention of the audience off stage as much as on it. She is calculated and icy, but also wrenched by the contradicting forces that impel her, as monarch, to make decisions whose outcomes she cannot trust: “If I heed the will of the people then the people will hate me for obeying the will of the people.” Living as we do in today’s model-less society who has ruled out monarchy (for Schiller, the French Revolution had brought the liberation of humanity a small step further), the two actresses have risen to the roles with boldness and have conveyed intelligently the thrust of the effects that historical circumstances had tossed them into. The queens are surrounded by men – lords and advisers, some partially loyal, some distinctly duplicitous and self-serving. Adam Whisner brings into the role of sir Amias Paulet, Mary’s jailor, the dignity that man can preserve in the face of fatal principle – Paulet was staunchly anti-Catholic but refused to lend a hand to the assassination of Mary. Peter Ooley is Lord Leicester, fulfilling the role of the trustworthy friend, deserving of Elizabeth’s affections but secretly craving the love of Mary. True to Schiller’s notion of art’s task, not all the drama of the play is historically accurate. Nor does the set yield to the notions of splendor we associate with court. Designed by Michael Hoover, it is mostly an open space, with asymmetric lines of columns cutting through it. Because civilization has crammed our consciousness with so many ideologies and conflicts, our blurry vision needs a stark stage for the image of truth to emerge and lead us on the path of authenticity, even beyond theatre.